Parrot Forum • View topic - Introducing adult Senegal Parrot to a new bird: Possible? Introducing adult Senegal Parrot to a new bird: Possible? So I own a senegal parrot, as my username suggest. Leo is 6 in September. My query is about introducing him to a new parrot. Before anyone jumps the gun here, let me point out that I haven't decided yet if I am or am not going to be buying another bird! I am just carrying out research at the minute. I should point out that while Leo has a cage, we never lock him in his cage. He has free reign of the house and has various perches around the house where he can go to when he wants to get away from his cage. Most of the time he just sits elsewhere, goes back to his cage for dinner time and then goes walkies again before returning to his cage for night time. We keep a cloth over his cage after he wants to go to sleep until 8am in the morning. Don't tell me that this causes him to have any issues cos that is BS... He is perfectly ok to be locked in his cage for a few hours if ever we have guests who are scared of birds but I do not believe in having him locked up at other times. His wings are clipped also. Aside from when Leo was with his breeder, he has not spent any time with any other parrots. I kept my friends' African Grey and Cockatiel one time for a month while they were away on holidays and Leo was very curious by them! He would sit on their cage and try to get close to them, all the while trying to nip them ha. Not aggressively mind you, he was just curious and didn't know how to react around them. A couple of times he did try to nip the cockatiel quite hard but I didn't allow that to happen. Not for lack of trying though haha.When I had those birds out and on my shoulder, Leo would try his hardest to join us! I kept him on my knee and he would just slowly edge closer. He was curios and not aggressive. But he didn't chill with them. For fear of attacks by him to the other two, I didn't keep them together much and as such I can't really use that experience to gauge how he'd be if we did get a new bird as he wasn't around them much when they were out of their cage. He's very attached to me but, unlike most Senegal's, he's also attached to the rest of my family. He gets on well with everyone but best with me. My parents are perfectly adept at taking care of him, as are my two siblings. And, more importantly, he is happy to be hanging out with anyone in the family. Although when he's cranky and I've been away, as soon as I come home and he see's me then he will not stay on whomever's shoulder is on to join me. 80% of the time though, he is fine to be without me. The family really wants a new bird but only if Leo'll be ok with it and if the new bird'll be ok with Leo. I'd again go with a young bird. Our options are either another senegal as we love them or an Indian Ringneck. I was wondering what experience people have with introducing an older senegal to a younger bird? I am not asking for techniques of introducing new birds, I am well aware. I have kept ring necks in the past and I had to introduce two of them to each other. They belong to my grandmother and are now perfectly adept to one another. At first it was a bit hairy though. I am just asking if you think an older senegal would ever be ok with a new parrot. If not, then why not? I think with a few months training of them being around each other and getting used to each others cages and each other presence that they can be integrated fine into the family. As for keeping them in one cage... That will only happen once I know that BOTH of them are 100% comfortable with each other. If that never happens, then they will never be in the same cage but have their own cages. I would ideally like the new parrot to have free reign as well. So any experiences to share? Would another senegal be better than a ring neck in terms of Leo getting used to it? Will Leo ever be ok with another bird? He is a very sweet, very tame bird. But he also stands his ground and doesn't back down. He's a bit wary of strange men but he adores women regardless of how many times (or if at all) he's met them before. He doesn't bite (aside from when he's getting his nails cut ha). when he's cranky and doesn't want to be handled he will utter a tiny growl and we know not to disturb him until he comes out of his funk (which usually is about 10minutes ha). I think I can integrate him with a new bird, but I will be doing my research until I do decide. I don't plan on getting a new bird (if I do decide to) until June 2013 at the very earliest. So please any help would be greatly appreciated! I am new to this forum so be easy. I have a few years experience with parrots and years and years experience with other pets. I adore my little guy and don't want to do anything that would endanger him in any way. Re: Introducing adult Senegal Parrot to a new bird: Possible? my bluefront was about 20 when an ex tried to win me back with a and he loved having another so much that when the passed i got him a he loved her too.so yes it is possible to introduce an older bird to another. Any experience with senegals though? They are a bit more possessive. really? you must have alot of experiance with s to know this.no i've never had a sengal.i had an older bird that enjoyed the company of other birds after 20 years of only people. Probably not gonna work out. Senegals are known to be one person birds which in other words means they only accept their mate and attack anyone and everything else. They are even known to be mate killers and will kill their mate after many years of sharing a nest together. I know at least several people who have had major accidents by combining other parrots with a Senegal. I know someone who had a Senegal bite a Quaker Parrot's leg off through the cage bars. Someone else on this forum had a Senegal Parrot sneak out of its cage and kill their Conure in its cage when they weren't home. 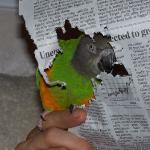 Lots of other chew and attack marks on other parrots from Senegals. They can be real bullies. Also, they'll go after birds bigger than their own size and put themselves at risk of counter attack by something much bigger. Senegal Parrots can get super jealous and that leads to aggression. You can using taming, training, scheduling, and diet to moderate some of this but you can never entirely eliminate it. With a lot of effort, it is possible to teach other people how to behave around the parrot and overcome problems. Not possible with another bird because they react in their own ways. Not many birds can stand up to a Senegal Parrot and I can tell you for a fact that my Cape Parrot who is 3x bigger is terrified of her. Since you are into clipping birds, it's even more likely to encourage fighting and endanger them. If they are kept clipped, on separate stands/cages, out of cage time supervised, etc you are probably fine but essentially they cannot be accessible to each other by foot or they will fight. From what it sounds like, yours climbs around a good bit and feels like it owns the whole house. That will definitely trigger a lot of competitive aggression. Don't even for a minute think you will ever cage another bird with that Senegal. Even in my 8x12x7ft aviary with 2 flighted parrots they just barely get by without fighting but inevitably Truman can't do anything when she's around. Anything smaller than that and there would be blood. You said that everyone gets along well with the Senegal, why in the world add another one and disrupt the successful balance? NEVER place a Senegal in with another bird! Even another Senegal. I have 8 Senegals. Don't even risk it. Micheal is absolutely right. I beg you to heed his warning. You are just asking for trouble and serious injury by placing them in a cage together. They aren't even safe to place on a playstand or your lap, or your shoulder together. You need to really think about this and act accordingly. Please take the advice given to you by Senegal owners such as me and Michael who are familiar with them. I'm sure that others will chime in to tell you the same thing. BTW...Senegals are often better as the ONLY bird. That is what they truly desire. They are extremely jealous and very territorial not of just things but of their person. You're really asking for trouble here. I think that since things are good with Leo you should just leave well enough alone. Oh, and in case you are wondering why I have so many Senegals they are rescues. Some are in need of adoption others need sanctuary. I have too much experience to write in a post, but if you'd like you can PM me and I'll give you more personal information based on real life experience with Senegals. As i said, i am merely carrying out research. Thank you for the input! I will reconsider certainly. What about a cat? If we say get a kitten and it grows up with Leo, could they co-exist? Much experience with this at all anyone? The cat would be kept outside of course, only allowed in with super vision and kept far from Leo (we have a big house and Leo stays at one side of it). I can see a lotta anger at my question but again, it is just research so chill. senegalparrotowner wrote: I can see a lotta anger at my question but again, it is just research so chill.